Hawaii recently mandated that all teachers would have to submit to a drug test to remain working in Hawaii public schools. Early contract talks are stalling out because the teacher's union is so opposed to the mandate. 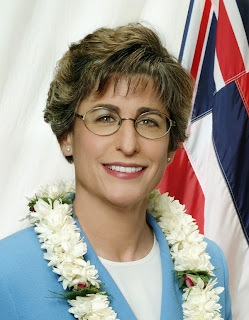 Governor Linda Lingle is all too aware of the problem, and is facing economic turmoil as well. The Hawaii Council on Revenues predicts a state tax decrease of $75 million. Revenue growth productions are also expected to decline. Lingle said that the downturn would force adjustments to the state budget and special funds. "I'm anxious for the election to get over and for the Legislature to elect their leadership so we can sit down (and) begin the discussion between us and the community," she said. Executive branch agencies have already been ordered to draft budget cuts of 10 to 20 percent. Lingle originally pushed for the random drug testing program for the teachers, and hasn't been able to implement it. She did release state funds for a last round of teacher pay raises despite the unresolved drug testing issue. The Hawaii Labor Relations Board is reviewing the current contract to see if it requires drug testing to begin. Teachers are fighting it, arguing that the drug test should be limited to cause for suspicion. Where the funds will come from to support the random drug testing program is unannounced.